Tubing down Fightingtown Creek in McCaysville, Georgia I hit a rock when I realized I was vacationing with blood kin. Only relatives. Don’t think that has ever happened in the last 33 years since I blended my family with another in marriage. How far northwest in Georgia is this destination? The children stood on the dotted blue line in the grocery store parking lot because one side is Copperhill, Tennessee and the other McCaysville, Georgia. Silly family photo spot, but more fun than pointing out “Welcome to” state signs whizzing along a highway. We saw other families doing the same thing, self-consciously and happy. When I fanny-bumped that rock in my inner tube, I was close to nephew Tom, an Ohio attorney who spent his high school summers at my house. Practical fellow this boy at age 16. He wanted to learn to drive, earn some money and figure out how it is living in America. He knows how things go in my house—good and bad, functional and maybe not. I think that’s an honest benefit of live-in relatives. We’ve offered similar opportunities through the years to this family of many extensions: a blending of six children, spouses and exes, many grands and great-grands. Invitation potential galore. We’ve pulled family crowds together for big beach house rentals. A mountain town is a new adventure. We drove to Blue Ridge too because that’s the way to gather fresh fruits for family meals. U-pick at Mercier Orchard, a three-generation family farm, involves a bouncy ride in a wagon and as many peaches, blueberries, strawberries or apples as everyone wanted, depending on the season. The Ocoee River is here, where the 1996 Olympic white water events happened. Easy to book a rafting trip with a guide, and pleasant to walk along manicured trails watching the water people. Blended Traveling Mom’s looking forward to more relatives in the mountains however they connect. Photo #1: Families of many ages U-pick at Mercier’s, a three-generation family orchard. 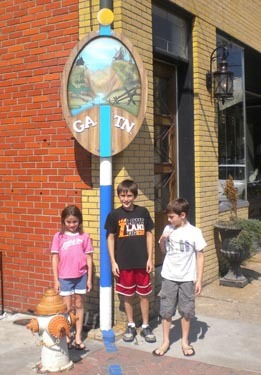 Photo #2: Nicole, Jack and Justin choosing states on the Tennessee-Georgia line. 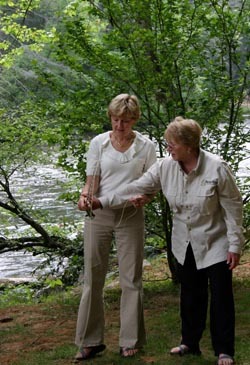 Photo #3: Blogger Christine Tibbetts takes her first fly-fishing lesson with Natalie Sharp at the Toccoa River. Sharper Bites serves gourmet lunches and dinners after a lesson.